sOMEThING - Hiroyuki Suzuki Signature Yo-Yo! sOMEThING is one of the most popular Japanese yo-yo brands presented by the world famous Japanese yo-yo store YoYoAddict, owned and operated by world champion player Hiroyuki Suzuki. 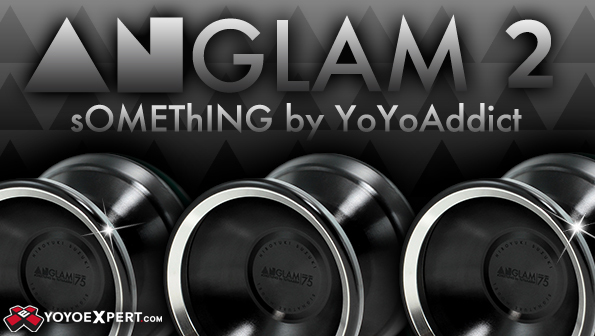 Their flagship yo-yo, the Anglam, just got a remodel! This is the Anglam 2! The Anglam 2 is Hiroyuki Suzuki's latest signature yo-yo and it needs to be able to handle whatever he can throw at it. sOMEThING gave the new and improved Anglam 2 a few small tweaks that really amp up the performance to fit Hiroyuki's ever evolving style! They added a curved step in the profile to reduce string rub on horizontal combos and give the newest Anglam an even more comfortable feel in the hand. You'll also notice the cup is slightly wider and deeper with a redesigned broader weight ring that fits flush with the outer edge of the cup. Pushing the center weight out to the rims greatly improves stability and spin time while reducing the overall weight gives the Anglam 2 a really fast and maneuverable play style! Speed combos, long horizontal tricks, or intricate tech - This yo-yo was designed to handle anything Hiroyuki Suzuki can throw at it, and whether you're a collector or a world champion you will love the new Anglam 2!